Cookies are one of those American inventions that even the most staunchly British chap feels utterly compelled to bake from time to time. However, it’s nice to vary things a little; I’ve never baked the same cookie twice. These aren’t in any way similar to my cardamom cookies or my American-style chocolate chunk cookies. Instead, the consistency found within the bites is both soft and fluffy; almost cake like, but not quite. This trait makes these cookies, rather conversely, almost more British than American. It’s rather tricky to decide whether there’s something morally, or indeed culturally wrong with such a thing. By far the best feature of my double chocolate cookie bites is the contrast between the light, creamy white chocolate and the dark, bitter cocoa. Indeed, ingredients which contrast, but don’t clash, often make some of the best culinary combinations. In this case, the two very different characteristics of each chocolate serve almost as a remedy for one another; no bite is too bitter, nor too sickly. These cookies work – to borrow the phrase of a small, greedy, fair-haired, fictional girl – ‘just right’. Though, let’s face it, the collective understanding of ‘The Story of the Three Bears’. More commonly referred to as ‘Goldilocks’, has about as much definite meaning as does the term ‘cookie’. How many of you knew that in the original version the character later dubbed ‘Goldilocks’ was actually a thieving old hag? 1. Let’s make this simple. Cream together the butter and sugars. Beat in the eggs, one at a time. Mix together the flour, baking powder, salt and cocoa powder. Tip the dry, along with the chocolate chips, into the wet and mix thoroughly. 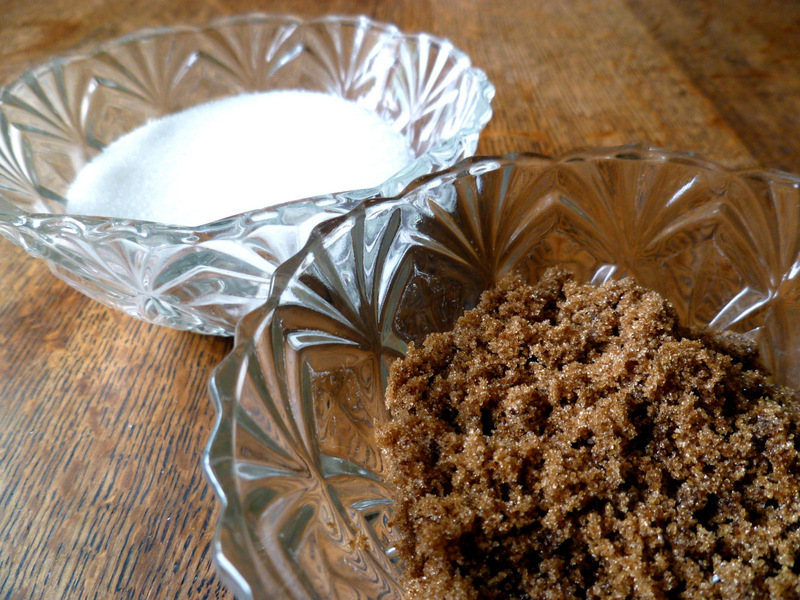 The mixture may need a small splash of milk to loosen it a little – flour tends to act differently from batch to batch. Leave the dough to rest in the fridge for an hour. 2. Preheat the oven to 190C. Divide the mixture and bake the cookies 5-6 at a time, this will ensure an even bake. Each batch should take roughly 10 minutes. They are done when they look cooked and are a little gooey in the middle. Leave to cool for a short while before eating, if you find it possible. Cost: Cookies tend to be incredibly cheap to make and these are no exception. The entire batch should, if one uses a medium price chocolate, cost around £2.30. Trust me, this is necessary expenditure! Thanks, Marcus. I like to deal with my chocolate in chunks, chips just aren’t the same. 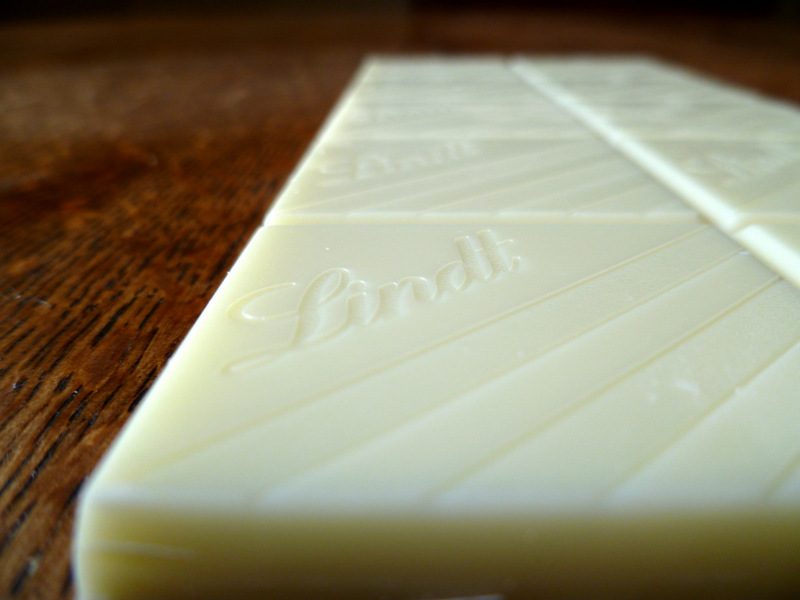 Love the use of white chocolate, for contrast and taste. Your cookies look very inviting, especially with that glass of cold milk. Thanks, Daisy. They worked very well together. You make them sounds irresistible! Yum. Thanks@! I certainly found them so. Thanks! Oh fantastic, they were absolutely lovely. Glad you liked them. They look fab!! Will be giving them a go tomorrow.!! Awesome! I hope you like them, Linda. Made them this evening…easy to make and gorgeous!! Awesome! Thanks, I’m so glad you liked them. These look so good Nick! I prefer chocolate cookies to be more cake-like. These look perfectly fluffy and great contrast with the white and bittersweet chocolate. Thanks! I think I agree you know. Yes, they were. I ate three right off the bat. Morally or culturally wrong? Who cares? These look good enough to excuse a multitude of wrongs! Awesome! I do hope you enjoy them. Love the look of these cookies, especially given with only a few tweeks I can make them vegan. Thank you for sharing the recipe for these tasty looking morsels. Oh yes. I was actually toying with making them vegan – but I couldn’t be bothered. Perhaps I shall do a vegan cake. I hope they work out well. They did and I did. 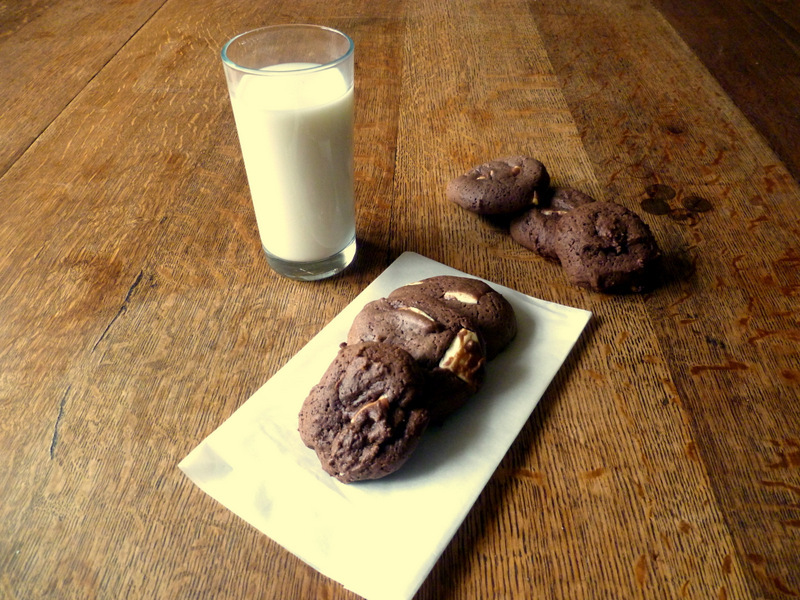 I love a good chunkie cookie, and whit choc chunks instantly make everything AMAZING – can’t wait to make these. Haha! I hope you like them. I adore larger chunks. Mmm now you’re talking my language – chocolate! ;). Homemade cookies are leagues apart from even good shop bought ones aren’t they? I read a tip from Jo Wheatley (GBBO2 winner) that if you take the tray out of the oven half way through baking, slam it down then return to oven to complete cooking, you get that elusive and hugely desirable chew I love in a good cookie as opposed to “biscuits”. Must try that idea soon. I’ll try it and show you my results! 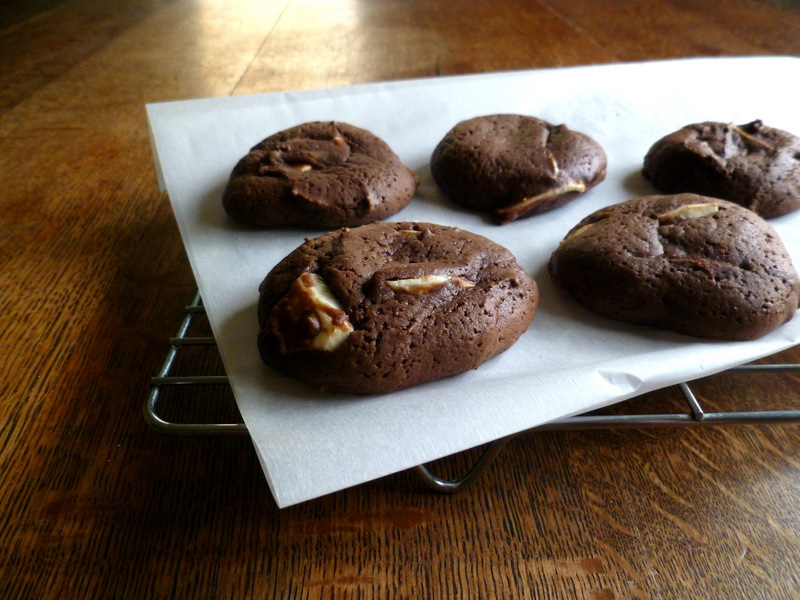 mmmm I love chocolate cookies 🙂 I’ve tried that tip about slamming the trays down halfway through baking – it does work! Oh drool you use Lindt white chocolate on your cookies!! In Oz that’s not medium priced, it’s top shelf stuff. Sigh, I miss the UK. These look awesome 🙂 but I couldn’t/wouldn’t wait the hour for the dough to harden in the fridge. It’s my short fall. Well, on this occasion I did. It was on offer too. It;s not the top of the top, but it’s gorgeous. Come back! I’ve still got some uncooked dough left over. Haha, yeh the old hag. Thanks, Hayley! I would love to dip that cookie in the milk. Without meaning to make you jealous – I did! I have been looking for a good “cake-like” cookie recipe. I am going to make this one for the hubs today. He will love it. Thanks for posting. Awesome, Connie. I hope you both like them very much. I thought they were wonderful. You had me a British Chap! My roots are British (was born, raised, live in Canada) and I’m a staunch upholder of them. That said your cookies look great and I know my grandchildren are going to love them. I like that you used Lindt chocolate instead of supermarket chocolate. Haha, awesome. Glad you keep in touch with them. I used the lindt as a treat, it was well priced too. I hope you like them 😀 Thanks for the comment. Just made these today…seriously good they are too! Thanks! So glad you enjoyed them. Yum 🙂 Love white chocolate chunks in cookies and love the mini size of these so you can feel less guilty eating lots and lots! thanks, Kate! Haha, yes. I certainly ate many. Oh my! Those look so good and I have to try them. I already know I will love them before I even make them. P.S. I love the pride you show in your recipes. Thanks! I do like to show pride, there’s no point doing them otherwise. These look awesome! Anything chocolate is delicious, but double chocolate is even better!! Thanks! It is! Perhaps triple next time! Chocolate and chocolate, my two favorite things! Haha, my third favourite thing is chocolate behind chocolate and chocolate too – what a coincidence. These look amazing and don’t worry, if you call them biscuits you’ll still feel really British right? Haha, I bet I did. Hia! thanks, Liz, they tasted great too. Lindt chocolate for the cookies. Awesome decision. They look fantastic! Oh yes – it was on offer. so yum. Fancy calling Goldilocks a thieving hag! Only you could do that and get away with it. Mind you I’d be a thieving old hag if these were around! Sureley it would be rude not too? I do apologise – but it’s true! Haha, it would be very rude! Ha, these cookies, cookie-cakes, biscuits, baked goods, choco-treats … whatever you call them look “just right” to me! Haha! thanks! I really was unsure what to call them. There’s a page for that at the top. They really were – I ate so many. 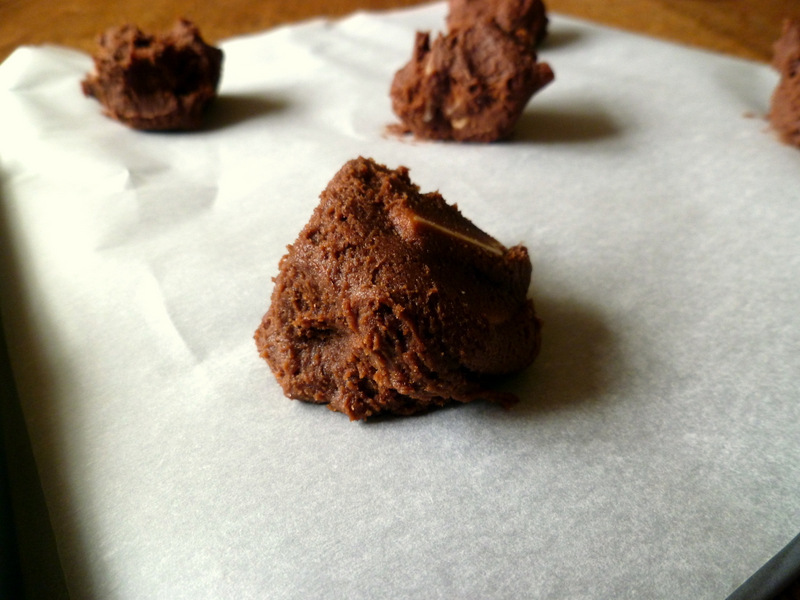 Just wanted to say I finally got around to making a batch of these after they caught my eye last month – though I had to tweak it into a dairy-free version using vitalite instead of butter, and with dairy free chocolate. I wasn’t disappointed and neither were my boyfriend or my flatmate – really good cookies, thanks! Awesome! I’m so glad they worked out well!